Passover (or Pesach) begins Monday March 25th and ends Tuesday 2nd April, and is an important Biblically-derived Jewish festival. It is the first of Judaism’s Three Pilgrimage Festivals (שלוש רגלים), the other two being Shavuot (“Pentecost”) and Sukkot (“Tabernacles”).The Jewish people celebrate Passover as a commemoration of their liberation over 3,300 years ago by God from slavery in ancient Egypt that was ruled by the Pharaohs, and their birth as a nation under the leadership of Moses. It commemorates the story of the Exodus as described in the Hebrew Bible especially in the Book of Exodus, in which the Israelites were freed from slavery in Egypt. In the narrative of the Exodus, the Bible tells that God helped the Children of Israel escape slavery in Egypt by inflicting ten plagues upon the ancient Egyptians before the Pharaoh would release his Israelite slaves; the tenth and worst of the plagues was the death of the Egyptian first-born. The Israelites were instructed to mark the doorposts of their homes with the blood of a spring lamb and, upon seeing this, the spirit of the Lord knew to pass over the first-born in these homes, hence the name of the holiday. There is some debate over where the term is actually derived from. When the Pharaoh freed the Israelites, it is said that they left in such a hurry that they could not wait for bread dough to rise (leaven). In commemoration, for the duration of Passover no leavened bread is eaten, for which reason it is called “The Festival of the Unleavened Bread”. Matzo (flat unleavened bread) is a symbol of the holiday. Historically, together with Shavuot (“Pentecost”) and Sukkot (“Tabernacles”), Passover is one of the three pilgrimage festivals (Shalosh Regalim) during which the entire population of the kingdom of Judah made a pilgrimage to the Temple in Jerusalem. Samaritans still make this pilgrimage to Mount Gerizim, but only men participate in public worship. Franklin continued to record a string of popular singles throughout the early 1970s, reaching her peak as an albums artist with 1970’s Spirit in the Dark, 1971’s Young, Gifted & Black and the 1972 gospel record, Amazing Grace, which became the best-selling pure gospel album of all time. Franklin’s success in Atlantic peaked after the release of the singles, “Until You Come Back to Me (That’s What I’m Gonna Do)”, “I’m in Love” and “Giving Him Something He Can Feel” and the 1976 soundtrack to the movie, Sparkle and Franklin left the label in 1980 to sign with Clive Davis’ Arista Records label where she switched over from soul and funk music to a more conservative urban adult contemporary sound in the albums, Aretha and Love All the Hurt Away, before regaining commercial success with the 1982 Gold album, Jump to It, produced by R&B hitmaker Luther Vandross. In 1984, Franklin added modern day pop rock and dance elements to her sound, which was integral to the success of her 1985 Platinum album, Who’s Zoomin’ Who?, which spawned the hits “Freeway of Love”, “Who’s Zoomin’ Who” and the Eurythmics members Annie Lennox and David A. Stewart featured “Sisters Are Doin’ It for Themselves”. The 1986 release, Aretha, featured her seventeenth Top 10 single – a #1 duet with George Michael entitled “I Knew You Were Waiting for Me”. Afterwards Aretha did not return to the Gold standard until the release of 1998’s A Rose Is Still a Rose, which incorporated modern day contemporary R&B and which the title track returned Franklin to the top 40 of the pop charts. March 25th has been designated Tolkien Reading Day. English writer, poet, philologist, and university professor J R R Tolkien, CBE is Best known as the author of the classic high fantasy works The Hobbit, The Lord of the Rings, and The Silmarillion. He was Born on 3 January 1892 in Bloemfontein. 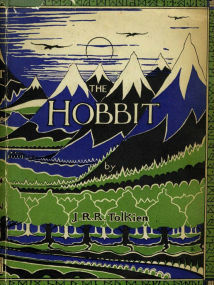 Published on 21 September 1937 to wide critical acclaim and Set in a time “Between the Dawn of Færie and the Dominion of Men”,The Hobbit follows the sometimes dangerous, but at all times exciting quest of home-loving hobbit Bilbo Baggins who joins the Wizard Gandalf and a company of thirteen dwarves led by Thorin Okenshield on a dangerous journey to the Lonely Mountain, to reclaim the kingdom of Erabor and the many treasures which have been stolen by the fearsome dragon Smaug. Along the way they encounter many hazards including Cave Trolls, Giant Spiders, Hordes of Orcs and Imprisonment by the Elves of Mirkwood Forest, as if that wasn’t enough something decidedly dodgy is also stirring in the Fortress of Dol Gulder, to the South-East of Mirkwood and there is plenty of related material in the appendices of The Lord of the Rings and Unfinished Tales, about the rise of the Necromancer and the subsequent Battle of Dol Guldur. The story culminates in a big battle between the men of Dale, The Elves of Mirkwood, The Dwarves of Erabor, the Hordes of Orcs and the Eagles as they all try to reclaim the treasure stolen by Smaug. Published as three volumes over the course of a year from 21 July 1954 to October 1955,as The Fellowship of the Ring, The Two Towers, and The Return of the King. The title of the novel refers to the story’s main antagonist, the Dark Lord Sauron, who Long before the events of the novel created One Ring to rule the other Rings of Power as the ultimate weapon in his campaign to conquer and rule all of Middle-earth and corrupt everyone. He is defeated in battle, and Isildur cuts the One Ring from Sauron’s finger, claiming it as an heirloom for his line.Sadly though Isildur is later ambushed and killed by Orcs in the Gladden Fields, and the Ring is lost in the River Anduin. Over two thousand years later, the Ring is found by a river-dwelling stoor called Déagol. His friend Sméagol immediately falls under the Ring’s spell and strangles Deagol to acquire it. Sméagol is banished and hides under the Misty Mountains, where the Ring extends his lifespan and transforms him over the course of hundreds of years into a twisted, corrupted creature called Gollum. He loses the Ring and, as recounted in The Hobbit, Bilbo Baggins finds it. Meanwhile, Sauron takes a new physical form and reoccupies his old realm of Mordor. Gollum sets out in search of the Ring, but is captured by Sauron, who learns from him that Bilbo Baggins now has it. Gollum is set loose, and Sauron, who needs the Ring to regain his full power, sends forth his powerful servants, the Nazgûl, to seize it. March 25th has been designated Tolkien Reading Day. English writer, poet, philologist, and university professor J R R Tolkien, CBE is Best known as the author of the classic high fantasy works The Hobbit, The Lord of the Rings, and The Silmarillion. He was Born on 3 January 1892 in Bloemfontein, and wrote Lord of the Rings whilst working as a Professor at Oxford University during the 1930’s. Huor’s son, Tuor, became involved in the fate of the hidden Noldorin kingdom of Gondolin. He married the elf Idril, daughter of Turgon, Lord of Gondolin (the second union between Elves and Men). When Gondolin fell, betrayed from within by Maeglin, Tuor saved many of its inhabitants from destruction. All of the Elvish kingdoms in Beleriand eventually fell, and the refugees fled to a haven by the sea created by Tuor. The son of Tuor and Idril, Eärendil the Half-elven, was betrothed to Elwing, herself descended from Beren and Lúthien. Elwing brought Eärendil the Silmaril of Beren and Lúthien, and using its light Eärendil travelled across the sea to Aman to seek help from the Valar. The Valar obliged; they attacked and defeated Melkor, completely destroying his fortress Angband and sinking most of Beleriand; and they expelled Melkor from Arda. This ended the First Age of Middle-earth. Eärendil and Elwing had two children: Elrond and Elros. As descendants of immortal elves and mortal men, they were given the choice of which lineage to belong to: Elrond chose to belong to the Elves, his brother to Men. Elros became the first king of Númenor. Akallabêth (“The Downfallen” comprises about 30 pages, and recounts the rise and fall of the island kingdom of Númenor, inhabited by the Dúnedain. After the defeat of Melkor, the Valar gave the island to the three loyal houses of Men who had aided the Elves in the war against him. Through the favor with the Valar, the Dúnedain were granted wisdom and power and life more enduring than any other of mortal race had possessed, making them comparable to the High-Elves of Aman. Indeed, the isle of Númenor lay closer to Aman than to Middle-earth. But their power lay in their bliss and their acceptance of mortality. The fall of Númenor came about in large measure through the influence of the corrupted Maia Sauron (formerly a chief servant of Melkor), who arose during the Second Age and tried to conquer Middle-earth.